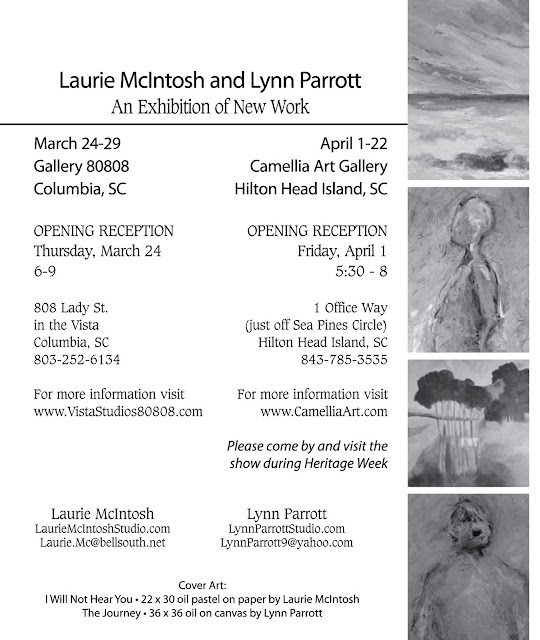 Laurie McIntosh and Lynn Parrott are sisters. Raised in Greenville, South Carolina, they are separated by a handful of years and the several dozen miles between Columbia and Hilton Head; yet, there is one thing, beyond sisterly love, that keeps them tethered to each other: art. And these sisters came by art honestly. Their mother, Agnes Brownell, is a highly educated and trained chemist; but at age 95, she still paints, as she has for all of her life. 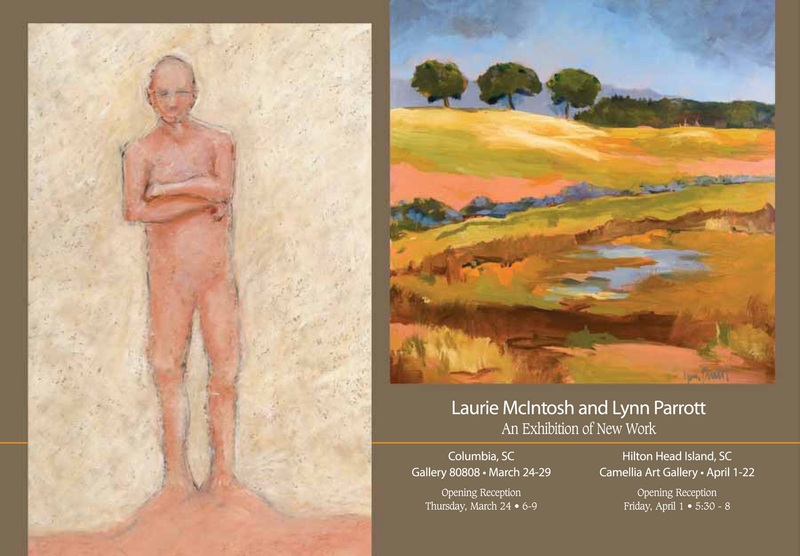 As Laurie and Lynn will both say, being raised in a family that supported and encouraged the creative process opened the doors for them to enjoy a life-long journey in art. Laurie’s work, Unspoken Communication Series, will intrigue others to consider what their body’s movements say. These oil pastels on paper are about body language and the idea of expressing and capturing an idea of a particular communication in a single image. “Albert H. Mehrabian experimented in the late 60’s and early 70’s and came up with this calculation in terms of how important the non-verbal movements, signals and gestures are when it comes to the overall effectiveness of our communication in relaying our message to others. Words account for only 7%. Body language accounts for 55%. But they are sisters, and this is an influence that cannot be denied. They share the interest of creating art, talking about art history, current art, supplies, mediums, events, and tools, and are passionate advocates and fellow board members for the South Carolina Governor’s School for the Arts Foundation. “I have so much fun sharing life with my sister, Laurie… our love of making art, talking about art, playing with art, and showing our work to anyone who will come to see it. It is a treasure to have Laurie in my now life as a fellow artist,” claims Lynn. One always hopes that, one day, relationships with siblings will move beyond the brother and/or sister thing into rich relationships of common interests and mutual delight in the other’s company. Most of us are blessed with this maturity. Few of us, however, enjoy the generosity and richness of sharing more than genes and parents… sharing a passion for a vocation that celebrates each sister’s unique talents and interpretations of the world around them while finding common ground in the absolute necessity of creativity and hard work. Through An Exhibition of New Work, Lynn Parrott and Laurie McIntosh share their most recent, individual journeys in art while enticing us to journey to a new place and consider our own unspoken languages. Association and the Low Country Artists.